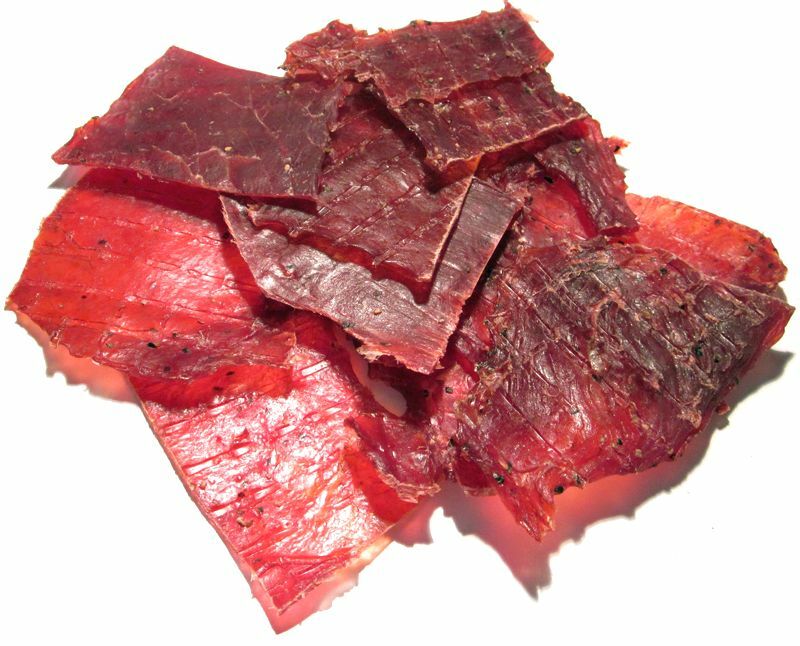 California Jerky Factory is a brand of California Jerky Factory, Inc. based out of So. El Monte, CA. The company appears to also operate as "Bach Cuc, Inc.", sharing the same USDA establishment number. Bach Cuc has its own line of jerky products. I've actually reviewed their jerky before under the "Diva Chocolates" brand, a brand that specialized in chocolate-dusted jerky. This label on this jerky says "Original Beef Jerky", but there's a smaller sticker below that says "Peppered", so I'm evaluating this as a peppered beef jerky. 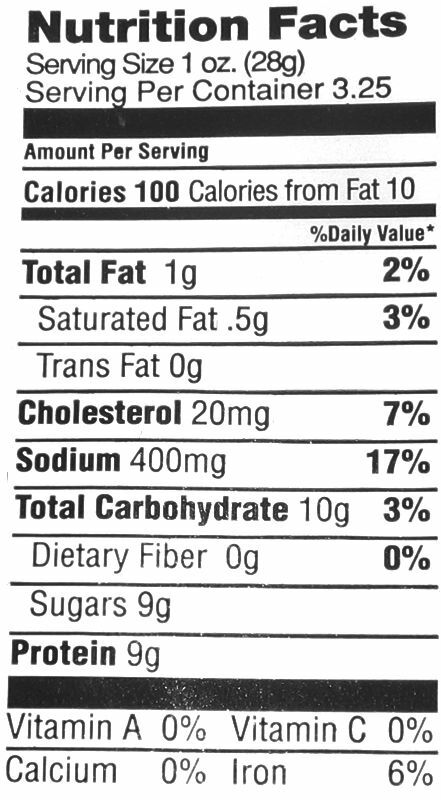 Beef, sugar, water, salt, liquid smoke, orange juice, black pepper, maltodextrin, hydrolyzed soy protein, sodium erythorbate, sodium nitrite. The first thing I taste from the surface of these pieces is a faint sweet. That's it. The chewing flavor starts with a tad more sweet, and maybe a touch of fruity flavor. After that, a light saltiness makes a showing, and towards the end I can pick up a faint bit of natural meat flavor. For being labeled "Peppered", I'm not picking up much peppery flavor at all. There's maybe a touch of peppery flavor here and there, and just a weak bit of black pepper aftertaste in the back of my mouth. Even though there's a fair amount of black pepper bits visible on these pieces, that's probably about all there is to warrant the "Peppered" sticker on this package. 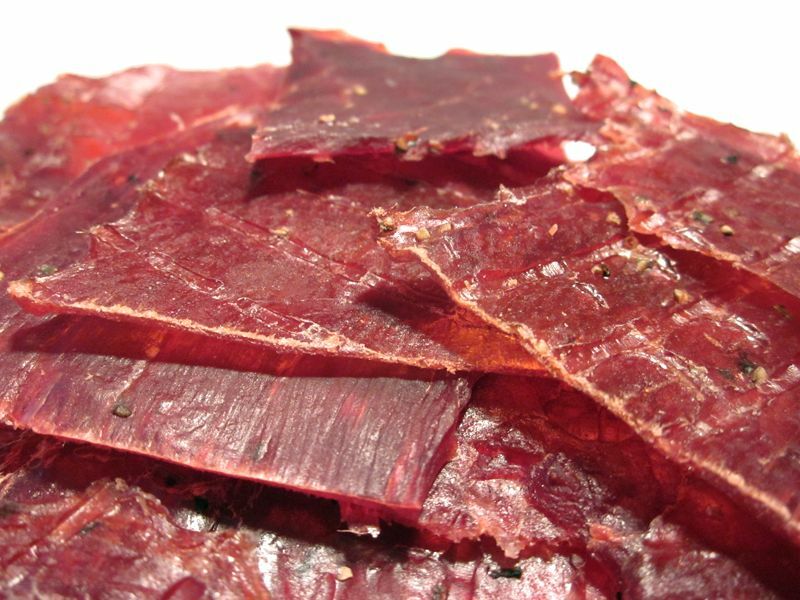 Otherwise, the flavor that seems to stand out the most in this jerky is a combination of light sweet and light saltiness. The natural meat flavors don't seem to show up until about the last few chews when much of the sweet and salty have been sucked out. And then it's just a very light flavor. That touch of fruity flavor I noted above only seems to be there in the first few initial chews. It's just a weak tanginess that lasts only a few seconds into the chewing and then it's gone. 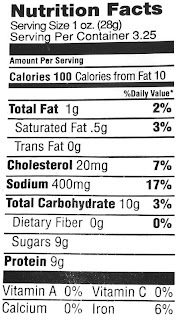 Overall what you're going to notice in this jerky is a lightly flavored jerky marked primarily by a light sweet and light saltiness. The black pepper in this is hardly noticeable with the exception of a few bites here and there are pockets of pepper in greater concentration. This is a dry jerky with a dry surface feel. It has a little bit of flexibility but will crack and break apart if bent far enough. Tearing pieces apart with my fingers seem quite easy to do, while chewing tends to be rather chewy, and a bit labored. The chewing texture starts out feeling stiff and a bit brittle. There's a fair amount of initial chewing resistance, but not unlike a lot of thin sliced slab jerky like this. As it breaks down it starts to take on a meaty, steak-like feel, and once chewed down to a soft mass, it tends to feel like a real steak, maybe a tad mushy. I don't see any visible streaks of fat, but I did find several pieces with a thin streak of gristle but I didn't feel it in the chewing. I didn't encounter anything unchewable and no stringiness. As for clean eating, my fingers pick no residue and I don't find any fragments of meat or pepper on my lap. I paid $5.99 for this 3.5oz package at the Pala-Rey fruit stand in Pala, CA, off of Highway 76. That works out to a price of $1.71 per ounce. For general jerky snacking purposes, at the $1.71 per ounce price, it provides a fair value. I'm not getting much snackability out of this due to a rather uninteresting flavor, but a good meat consistency and chewing texture for a thin sliced, dry slab jerky. That price is actually about what you'd pay for a major brand of jerky at the grocery store, and it offers about the same snackability. 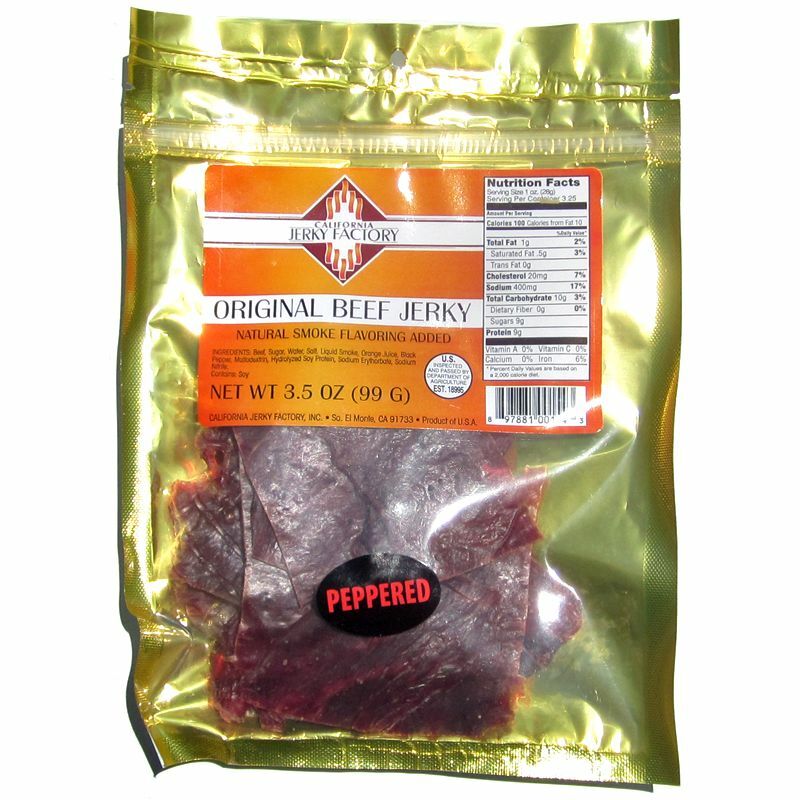 As a Peppered jerky, at the same $1.71 price per ounce, it's a weak value. I'm not really getting much peppery flavor from this, maybe just a little bit here and there, but overall there isn't enough black pepper flavor here to warrant the "Peppered" sticker in my opinion. 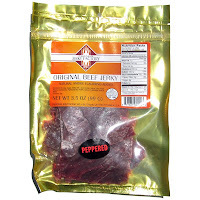 Wal-Mart's Peppered Jerky will give you more peppery flavor at a lower price, with a better overall flavor. This Original Peppered variety from California Jerky Factory doesn't seem to provide much black pepper flavor that I can tell. I mean, there does seem to be a faint black pepper flavor back there, but for having a sticker on the front that says, "Peppered" I expected to get an easily noticeable flavor. Otherwise the overall flavor of this jerky is rather light. It's mostly just a light sweetness and a light saltiness that defines it. I don't really get any natural meat flavors except for a very light flavor in the last few chews once the sweet and salty have worn off. If just a light sweet and salty is all I'm getting out of this, there just isn't enough in here to interest me. The meat consistency and chewing texture is perhaps it's best quality. It's easy to tear apart, though chewing can be labored. But it still seems to chew like real steak once its chewed down to a soft mass. My recommended beer pairing for this, go with a red ale, it'll give you a lightly roasted malt flavor and just enough hops to help bring out the flavor of this jerky. Try the Red Rocket Ale or the Red Trolley Ale.